What printer should I buy? That is one of the most frequently asked questions we get at WTFFF?! 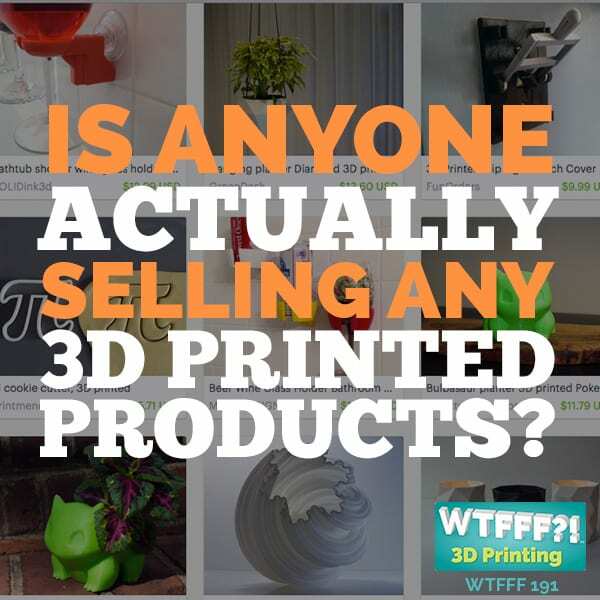 Once you have decided to take the plunge and buy your own 3D printer, your head may spin as you weigh the options and ever-growing choices of 3D printers on the market. The multitude of features and benefits that differentiate each printer mean that there is no one printer that is a perfect fit for all users. So the question is very hard to answer, because it depends on WHAT kinds of things you want to print, your skill level, and your budget. We first saw the Polar 3D printer when it debuted at CES (Consumer Electronics Show) in January, 2015. Its open design, circular build plate, and rotational movement immediately caught our attention. 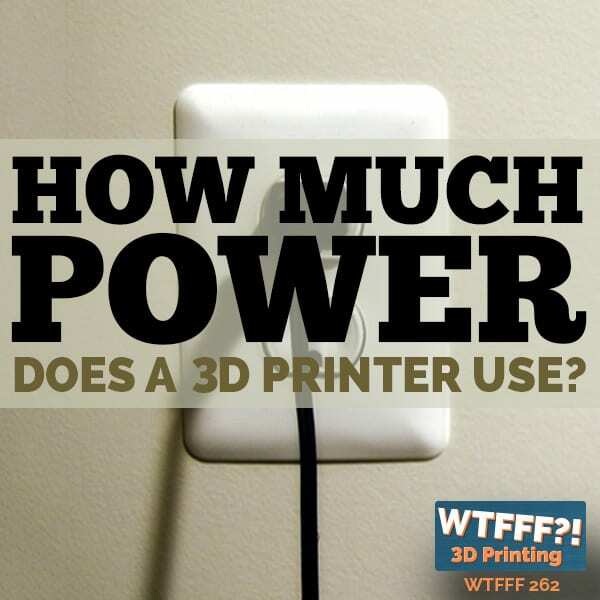 Fast forward to August, and Polar 3D submitted one of their printers to WTFFF?! for a formal review. 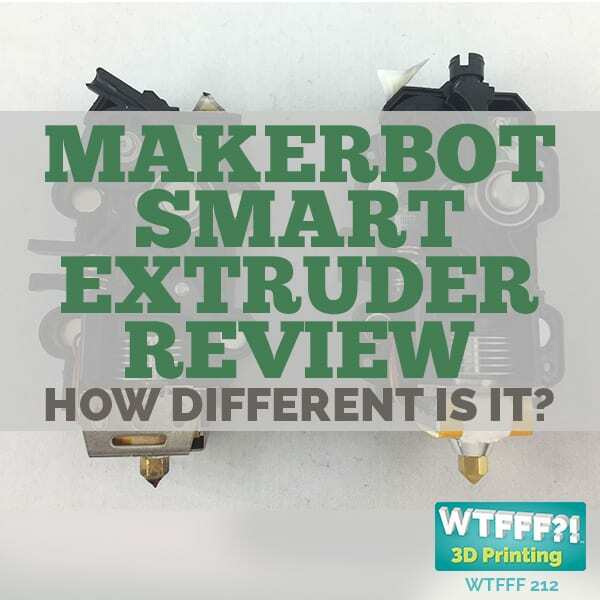 We have now spent a considerable amount of time over the course of more than a month getting to know and understand this unusual but impressive 3D printer. After weeks of working closely with the printer, we interviewed William Steele, CEO of Polar 3D, and the chief engineer/creator of the Polar 3D printer. This Polar 3D printer review is a supplement to the podcast that goes into more technical detail. As we opened the box we found a single page of Getting Started instructions to guide us through the set up process. Additionally, there is a Polar 3D video tutorial series on Youtube that you can view to get more detailed information. 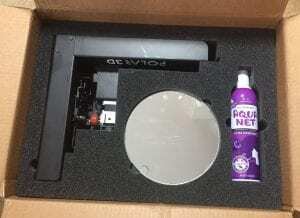 The “L” shaped steel frame, power cord, can of Aquanet hair spray, starter spool of filament, and circular build plate are efficiently packed and very well protected in a small but sturdy cardboard box. The set up is very straight forward, put the frame on a table and plug it in. There is no power button on the printer, so plugging it in turns it on. The Polar 3D logo immediately lights up and changes color to indicate its network status. It has built-in WiFi, and broadcasts its own WiFi hotspot for you to connect to. Once connected to the hotspot you can set it up to connect to your local WiFi network. I found that it had trouble connecting to our network with a hidden SSID, and while there are work around instructions, we found it easier to just connect it to our network via an Ethernet cable. Once we did it was immediately connected and available on our local network. Filament feeds through a small hole above the handle of the printer. Loading filament into this printer is the easiest we have experienced. A stainless steel wire formed mount flips out from the back and provides a hook to hold the spool of filament. The end of filament is pulled over the top, through a guide hole at the top, and is inserted directly into the top of the extruder assembly. You push the filament past some initial resistance until it stops, and it is ready to go. What is surprising about this is that you do not have to thread the filament through any guide tubes. 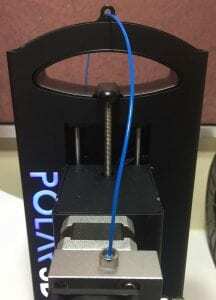 Since the filament drive gear and motor are located right on top of the extruder, the filament is being pulled, rather than pushed, to the extruder. Additionally, unlike any Cartesian (typical) 3D printer, the Polar 3D extruder assembly only moves up in the Z axis. The white plastic (Bowden) tubes are only needed on printers that push the filament to the extruder from a remotely located motor, or to keep filament from interfering with other objects as the extruder moves around the X and Y axes. The build plate is a glass mirror disc with a gear and center point glued to the bottom. Polar 3D recommends spraying the surface with Aquanet hairspray to get the extruded filament to stick with consistency. We followed the instructions, and it did work, but we found spraying it, waiting for it to dry, and cleaning it up (with water) to be cumbersome, and took more time than we wanted. Also, the entire build plate surface becomes tacky, so it picks up any dust that is drifting around in your environment. So after giving it a fair try, we are not big fans of the hairspray. The build plate was pre-calibrated out of the box, so I just snapped it into place and it was ready to go. Screenshot of the Polar 3D software preparing one of our models to print. Polar 3D recommends preparing your files to print in their Polar Cloud. As its name indicates, the Polar Cloud is an online forum for all things Polar 3D. To use it you need to sign up and become a member, after which you register your 3D printer and give it a unique name in the system. Once connected to the Polar Cloud you can prepare and send models to print. 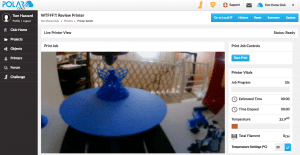 The Polar 3D printer has a camera built-in, so you can watch a live view of your print remotely through the Polar Cloud. You have options to upload models you create or find existing models, choose your print settings, and send them to your printer. There are preset default settings to choose from including Draft Mode, Advanced, and Expert settings. You can customize and save presets of your own once you find what works best for your prints. 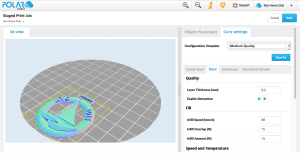 Polar 3D uses the Cura slicing engine to prepare models to print in the Polar Cloud. Once you send a prepared model to the printer and select Start, the magic begins. This printer operates so differently from any other conventional 3D printer, it is fascinating to watch. On Cartesian (conventional) machines, the build plate is rectilinear, stationary, and the extruder moves from left to right, front to back, layer by layer. On the Polar 3D printer, the extruder is stationary (only moves up layer by layer), the build plate rotates 360 degrees, and moves linearly from the center of the build plate to its edge (its radius). The result is a very unusual spinning movement that allows this small printer to have a very large build volume compared to anything in its size and price range. One of the most pleasant surprises of conducting this Polar 3d printer review was learning how quiet it is! We have several 3D printers in our home office, which is right outside our your daughters’ bedrooms. We (and our children) have come to accept the constant noise of electric motors and tones that would make you think R2D2 is a permanent resident. The Polar 3D printer is so quiet that the first evening it was running in our home office, Tracy put our youngest child to bed, passing the printer on the way, and did not even realize it was printing. Why is this printer so quiet? Polar coordinate printing inherently uses less moving parts , bearings, motors, and the few linear moving parts it does have travel shorter distances to achieve the same results. One key advantage of printing with polar coordinates is that the printer has a very large build volume, but I did find one potential drawback to the circular rotating build plate. Due to the physics of how the build plate rotates and moves about its radius, the extruder is forced to travel very slowly through the center of the build plate. 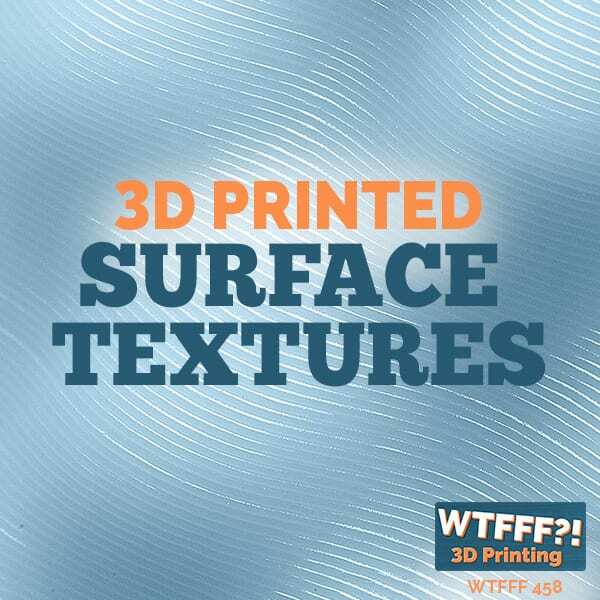 This can cause extra extrusion or oozing at the center, and the hot nozzle traveling very slowly in this area reheats the previously printed layers more than it should. Re-calibrating the X axis (center position) of the build plate helped, but did not completely eliminate it. If you are printing smaller objects that do not need to occupy the center of the plate, then this will not be an issue. We see this as only a minor drawback or consideration. 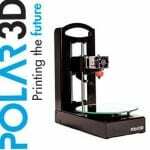 Polar 3D is primarily marketing this printer to students, educational institutions, and beginners. Everything about this printer is designed or engineered with students in mind. The “L” shaped frame has a handle built-in to the top, making it easy to carry from one classroom to another. The open design of the printer makes it easy to view a print from nearly all the way around, which is ideal for students in a classroom setting. Since it is possible to get very close to the extruder, it has been insulated to protect against burns. The build plate moves freely, and curious students might try touching it, so all the motors are designed to accept any resistance they encounter, putting safety above the printed part. There is no display or control button of any kind on the printer, which is by design so curious students do not have the ability to change anything directly on the printer. You can still control it, check the current temperature, extrude some filament, home the nozzle and plate, print a file, update the firmware, etc., through a local IP address interface that looks the same as the Polar Cloud interface. The cost of this printer is very reasonable at $799, students and schools can buy it for $599, perfect for tight school budgets. Polar 3D advises that you can also use conventional blue painter’s tape instead of the Aquanet. Since that is our preferred build plate surface material, we did most of our testing using blue tape. Since the printer’s default calibration was set for the hairspray, it needed to be recalibrated for the increased thickness of blue tape. Built-in to the firmware are two Calibration wizards that are quick and easy to use, one for the Z-axis and one for the X-axis (to locate the center of the build plate). One of the advantages of a Polar coordinate printer is that the build plate only needs to be calibrated in one Z-axis location. Anyone who has experience calibrating a Cartesian printer build plate will appreciate the simplicity and ease of this process. While this printer is small, it is powered by some robust hardware, the Raspberry Pi 2. This means the printer has a pretty smart brain, and is capable of slicing STL files on board, with no eternal software. The printer will even broadcast its own WiFi signal, so you can send an STL file wirelessly to the printer, and it will start printing without being connected to any other network. I can see that function coming in handy for some educational settings. The caveat is that the on board slicing uses default settings only, but Bill Steele informs us that in the near future the user will have the ability to change those default settings. If you are an experienced user and prefer an advanced slicing software like Simplify 3D, settings profiles exist for the Polar 3D printer, but you need to connect your computer directly via USB to use it. We tested this method and found it worked very well. 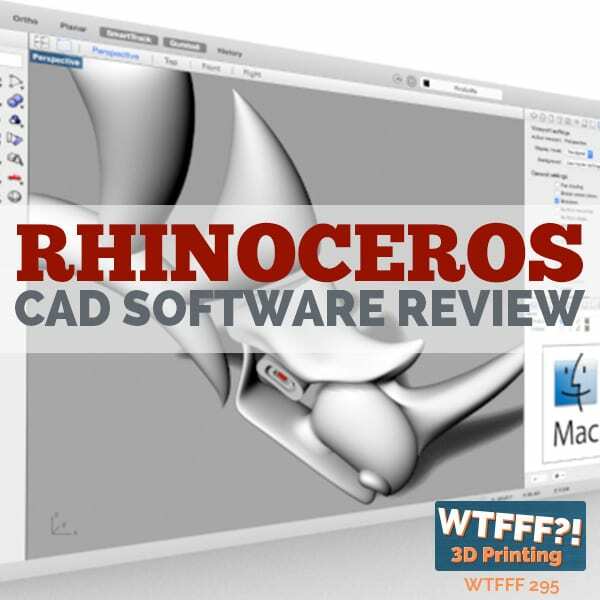 Over the course of conducting this Polar 3D printer review we continued to become more impressed by its simplicity, build volume, proprietary cloud software, quiet operation, and safety features. This printer is hard to beat, especially for the price, and we recommend it, especially for students and first time users. To send us a voicemail, go to hazzdesign.com or shoot us a message on our facebook or twitter! Its absolutely free, so ask away and and don’t forget to subscribe so you can hear more on our regularly scheduled Thursday podcast episodes! After 20 years at Microsoft and work with Boeing and NASA, Bill decided to fix the “ills” of the personal/desktop 3D printing world, namely reliability and ease of use, by taking a radically different approach to the design and function of the device. Polar 3D focuses exclusively on the education market and is committed to delivering the leading 3D printing ecosystem that will help educators teach, students learn, and entrepreneurs flourish. I agree. I own one and this was/is an excellent first printer. 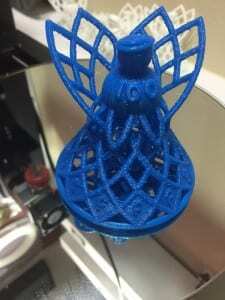 Hi Derrick, Polar3D did well on complicated prints in general, but there are a few caveats. It seemed to have a difficult time printing in the very center of the build plate. So complicated prints would do best if they are kept to the area in between the outer edge and center of the build plate. It can print in the center, but the way the printer works, the center does not print as cleanly. Also, the printer is designed to be ultra safe for kids. So if anything hits the build plate while printing, the build plate will give way, and can become offset from the portion of the print that already completed. If that happens you might as well stop your print and start over. I actually love this printer, and would buy it for my kids, and recommend it for students or a starter 3D printer. It is well built and has fewer moving parts to break down than conventional cartesian 3D printers. I hope this response is helpful! I’m having trouble with calibrating and though you talk about here, you don’t really give any details as to how to do a recalibration and I can’t find anything on the web that tells me how to do it. 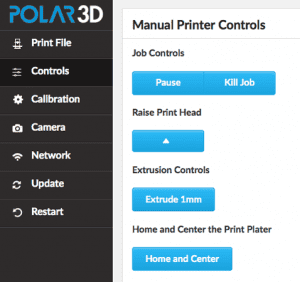 Is there anywhere I can go that shows and/or tells me how to recalibrate my Polar 3D printer? We no longer have that 3D Printer here, it was a test printer that was eventually sent back to them. I do remember that the calibration functions were accessed via your web browser, connecting directly to the printer’s IP address through wifi. If I remember correctly, you will also find manual printer controls there to raise the extruder, heat up the nozzle, etc. There is a good video tutorial series on YouTube for the Polar3D printer, but I just checked and can not find any video on calibration. Calibration is much easier on that printer than others because you only need to calibrate the Z axis (pretty easy to do too), and the X axis. The X axis calibration is a pretty simple procedure of lining up the nozzle with the center of the bearing that the round mirror plate sits on. You need to initiate the process by the calibration wizards or buttons that exist in the printer’s onboard software. If you continue to have trouble please let us know and we will connect you to someone at Polar3D. Thank you for reaching out to us!